In 1887 Catholic German immigrants in the West End built a wooden church along West Third Street. That building lasted until 1910 when fire destroyed it. St. Clement’s looked to German-born Milwaukee architect Erhard Brielmaier, who had designed Milwaukee’s Basilica of St. Josephat, which he modeled after Rome’s St. Peter’s Basilica. The two-story brick St. Clement’s featured both Gothic and Romanesque styling and sported arched windows, turrets, and two towers, one a 134-foot square bell tower with an open belfry which held the bell from the first St. Clement’s. A triple-arched stone entrance was surmounted by a large rose window in the front gable. 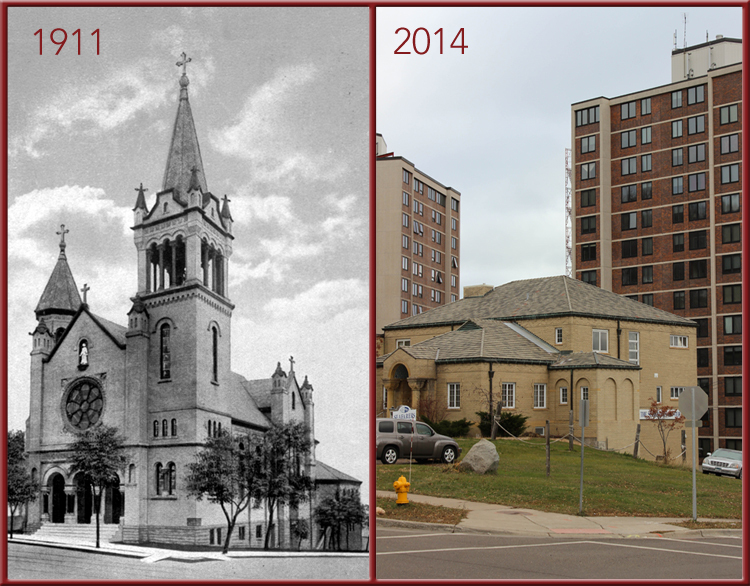 As Duluth’s neighborhoods became less ethnically divided, so did its churches. Mass attendance also started to decline. Soon the West End had more Catholic churches than it needed. St. Clement’s closed in 1972, its congregation absorbed by St. Jean-Baptiste’s. In 1975 St. Clement’s Church was purchased by the Twin Ports Ministry to Seafarers, an ecumenical organization that ministers to “those who visit our ports by ship.” The Seafarers converted the rectory into their facilities and demolished the church in 1992. The former church lot now provides parking for the Seafarer’s facility.